"The more people who feel safe and supported, and the more resilient our communities become, the sooner this sad era will end." In the wake of yet another school shooting, I find myself at a loss for words. Once again, we face the horror of school children being gunned down in a place that is supposed to be a safe haven. Once again, we see phrases in the news like “loner,” and “mental health issues,” along with a new hashtag to separate this school shooting from the hundreds of others that have occurred during the social media era. Once again, we hear calls for gun control as well as thoughts and prayers. Once again, we talk at each other instead of to each other, perpetuating the cultural problem we are entrenched in. Having shared several responses to school shootings over the years, there is a part of me that just wants to cry in response to the Santa Fe High School shooting. Sometimes it feels like no matter what I write, no matter how many discussions I have about empathy, no matter how many principals and superintendents I talk to about social and emotional health, that we are no closer to solving this problem than when the Columbine High School Massacre occurred in 1999. Every year, schools invest more in social and emotional learning. Students are learning more about their emotions than ever before, and they’re learning skills to communicate and manage them with the support of their peers and community. It’s more and more common for teenagers to identify and discuss their anxiety, depression, and other mental health issues that used to be taboo topics. Earlier this month I had the opportunity to visit one of our partner schools. Having the opportunity to speak directly to the children and young adults we’re attempting to support was a clear reminder of why social emotional learning and mental health is so important for schools. 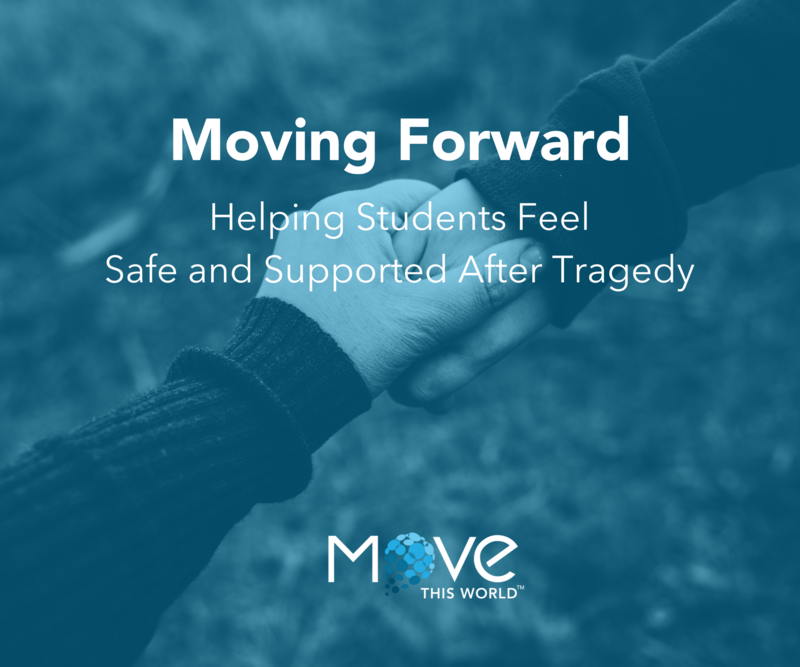 One eighth grade student shared that when they started the Move This World program three years ago they often felt angry, but weren’t sure how to express this. They found themselves getting into disagreements with other students, which often led to fights, hitting, and trips to the office. Three years later they know what stress, anger, and disappointment feels like in their body. Rather than leading to conflict, they put their strategies into place by taking deep breaths, going for a walk or reaching out to an adult when they need help. Clearly, we still have a long way to go. The empathy revolution, as we call it, will not be complete until every community has the tools they need to navigate difficult emotional issues. Ultimately, there isn’t a sweeping solution to prevent violence in schools. Individually, none of us can say or do anything to make our societal problem go away, but collectively we can say or do things for other individuals to mitigate the effects of their problems. We can spread positive energy, we can support one another, we can lead with love and empathy. We may not prevent the next tragic event from happening. Just as the survivors of Parkland are supporting surviving Santa Fe students, they may have to do the same for another community in the future. It’s critical that we embrace the need for healing in these times. The more people who feel safe and supported, and the more resilient our communities become, the sooner this sad era will end.